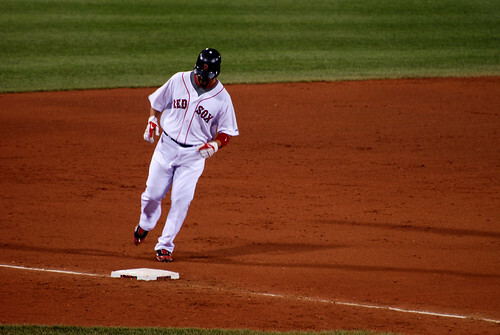 Alex Gonzalez touches third on his home run trot, originally uploaded by Bart Hanlon. Look, I liked watching Gonzalez pick it as much as you did. Maybe more. But the angst over his departure? I just don’t get it. Nobody wants another season of Nick Green starting at short, we can all agree on that. But seriously, this is a career .689 OPS player we’re talking about. For context, Adam Everett, who is even better defensively, carries a .648 career OPS. Did I mention that he’s available? On a related note, I’ll admit it: the the assertion that Scutaro is a foregone conclusion here, in the wake of Gonzalez’ departure, baffles me. Think about it: Theo’s on record as saying he believes that Lowrie is a credible option as their starting shorstop, but that he can’t be relied upon given his injury history. He’s also on record as saying that Iglesias – the $8M Cuban defensive sensation – is their shorstop of the future. Why would the Sox then feel compelled to a.) surrender the picks (assuming he’s offered arbitation) and b.) commit to the years necessary (three, from what I’m seeing) to land Scutaro? Nothing’s impossible, but this strikes me as unlikely. I think it’s far more likely they go with Lowrie plus a safety net. Much as we thought they’d do all along. And is Everett, as an example, that much worse an option than Gonzalez? Offensively, both Everett and Gonzo are, effectively, outs. Why not get the better glove, then, given the fact that we need to improve our defensive efficiency? Or if you prefer some offense, go get O-Cab, also still on the market (and yes, I’ve heard some pretty sordid details of his off-the-field activities last time around). Either way, I just don’t see how you build the case that says that this is somehow a disaster for the Sox. If the front office believed that Gonzo was their only realistic option at short, don’t you think they would have signed him already? The front office is many things but stupid generally isn’t one of them. And this club sure as hell doesn’t have problems signing free agent shortstops. No, most of the reactions I’ve been seeing are over-rotations that ignore both the options we know about – Cabrera, Everett, et al – as well as the ones we don’t (Y Escobar?). In the wake of the front office’s less than brilliant results in staffing the shortstop position the last few years, I’m not prepared to argue that the plan for next year will be a good one. But the arguments that I’m seeing, that the Red Sox don’t have a plan, well, they just seem foolish. If Nick Green, or next year’s Nick Green, Tug Hulett, is our starting shortstop next season, feel free to come back and say I told you so. But me, I’m willing to bet that the front office has a better plan than that. I with you here, SOG. As much as Gonzo solidified a turbulent spot, his worth was inflated due to how poor the group as a whole was. While he has been the best of the group for the last 4 years or so, with some love to O Cab, that's not saying much. As Coach Farley used to say,"Best of worst, worst of the best. Doesn't much matter." @Josh F: precisely so. assuming that they have interest in Scutaro, i think the Sox will determine what they're willing to pay him and – if he asks for more in years or dollars – they'll move on. if anything, the past year should serve as a lesson for all of us: if we can win 95 games with Nick Green playing the bulk of the time at short, we can probably get by for a year or two until the real guy arrives. @Josh F: saw it, and will have something up on it shortly. opinions are all over the place.